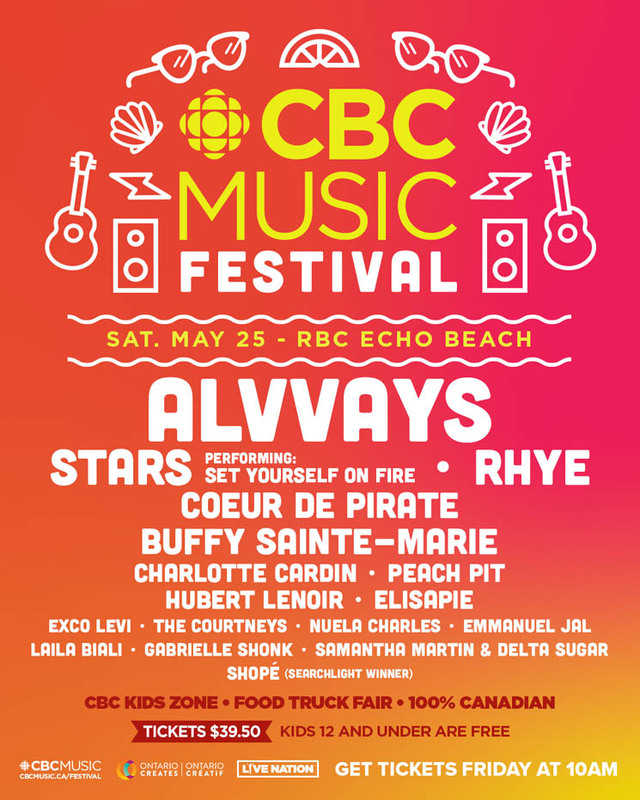 CBC Music Festival will return to Echo Beach in Toronto on May 25, and Alvvays have been announced as the fest headliners. On top of the Antisocialites band, the one-day outdoor festival will also feature performances by Stars (playing Set Yourself on Fire in its entirety), Rhye, Coeur de pirate, Buffy Sainte-Marie, Charlotte Cardin and Exco Levi. An additional q-curated stage, meanwhile, boasts sets by Peach Pit, Hubert Lenoir, the Courtneys, Emmanuel Jal and CBC Searchlight winner Shopé. A third stage, the Juno 365 Stage, will mark its inaugural year with performances by Elisapie, Nuela Charles, Samantha Martin & Delta Sugar and Laila Biali. Live Nation pre-sale tickets for CBC Music Festival will be available at 10 a.m. EDT today, with tickets going on sale to the general public on Friday (April 12) at 10 a.m. EDT. General admission is $39.50 plus fees, and children under the age of 12 can get in free. Find full festival information and updates at the official CBC Music Festival website.